The equipment is too expensive. My beers turn out fine without it. Making a yeast starter is not only easy, it’s easy to learn! You can start making a yeast starter with only $10 worth of equipment and then for $2.50 for each batch. You can always upgrade in the future, but a simple glass jug with a piece of aluminum foil will do the trick. Making a yeast starter should only take a half hour. The ideal time to let a yeast starter run is only 16-24 hours, so you can make a yeast starter the day before you plan to brew. Your beer may be good now, but with a yeast starter it could be great! So with all that being said, how do you actually make a yeast starter? I’ve outlined the process below and have created a handout to make brew day a lot easier. Step 1: In a small sauce pot bring 2L of water up to approximately 120° F.
Step 4: Take the mix off of the heat and cover, allowing to cool till it reaches 70° F.
I really like the idea of a SMASH (Single Malt and Single Hop) beer, but I often find them to leave you wanting a bit more complexity. For me the best way around this is either a single malt OR single hop beer. For this beer I chose to use a reasonably complex malt bill but only use a single hop all through the brew. I chose equinox because I found the description to be fascinating. The good people at hop union describe it to have “a pronounced aroma profile with citrus, tropical fruit, floral and herbal characteristics. Specific descriptors include lemon, lime, papaya, apple, and green pepper.” I was curious what this hop could do to a beer when it was left on its own. At about 15% alpha acid, it’s not what some would consider a dual purpose hop, but I’ve seen a growing trend in the home-brew community of ignoring alpha acids and focusing on flavor. During fermentation this beer had a bouquet of tropical fruit, with a potent aroma of mango and papaya coming from the airlock. 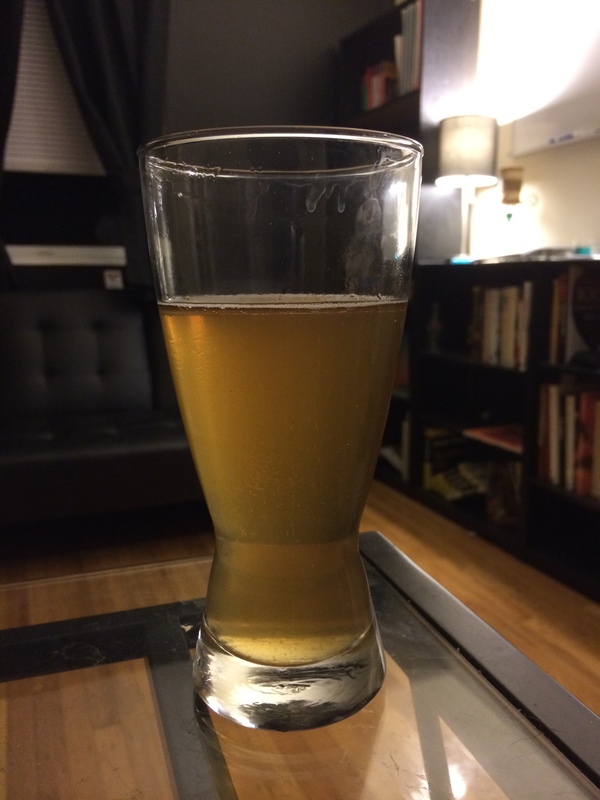 When I first sampled this beer right after fermentation, I was shocked that the aroma and flavor were strongly reminiscent of green bell pepper! Now don’t get me wrong, this was not at all unpleasant, just unusual. As it has mellowed in the keg, the aroma is now lime and papaya with the flavor bringing forth soft lemon, pineapple, and still a hint of green pepper. I can definitely classify this beer as a success, although I am not sure if I would brew with 100% equinox again. This beer was a fun project. I love a good cider but wanted more of a “beer” flavor profile added to it. It proved to be a really nice combination. I also added chamomile since many have described the flavor as “apple blossoms”, and I am a fan of chamomile tea. The final result is a beer that is a solid drinker, refreshing, with a bit of an apple twist that makes it the perfect beer for the beginning of spring. If/When I make this beer again, I will add the Apple Juice closer to flame out. Hopefully this will preserve more of the apple character in the beer. It is present currently but very faint. A while back, I decided to try brewing with a black tea base. 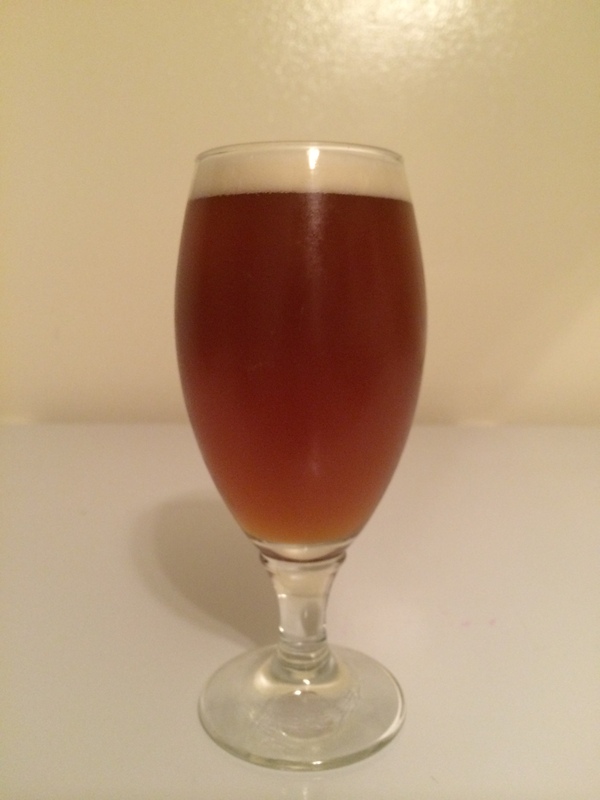 I have always been a fan of Constant Comment tea and, upon realizing that the tea is produced using many of the spices that brewers commonly put in their beer, I thought it would make a great addition in my beer. I decided to start with a base of wheat beer. My classic recipe for wheat beer is 1 part Pilsner Malt to 1 part Wheat Malt. In addition to this basic mix I decided to add Honey at Flame out. I went with a good and classic German Wheat (Wyeast 3333), and fermented at pretty warm temperatures (70 degrees). For the tea portion of the beer I went with 3 Constant Comment Tea Bags per gallon, put in at 3 minutes before flame out and taken out before cooling the wort. The beer turned out to be good, but not great. The beer has a nice nose of ester and a hint of Constant Comment. The taste is what makes this beer stand out. At the beginning you can definitely taste the unique blend of spices that makes this beer stand out. The disappointing part comes out on a few seconds after the sip. There is a bit of a bitter aftertaste which comes out, putting a a damper on the nice flavor you get a the beginning. This flavor is very reminiscent of the bitter taste you get after over brewing a tea (definitely different from a high hop bitterness). 2) I was trying to go for a honey like taste in this beer, to complement the tea flavors. Unfortunately fermented honey does not taste like the substance we put in our tea. Instead of using so much honey, try going with something like Honey Malt, all of the flavor without the warping process of fermentation. 3) Less is more. I think that the tea has a VERY powerful presence. I think 1-2 bags could have done considerably better than 3. Even though this might take out some of the nice flavors, it will also prevent the black tea from becoming overwhelming. 4) Do NOT treat this like a Heffe. This was a mistake I made when I poured my first bottle of this beer. The taste of the yeast made this beer almost undrinkable. It is definitely a palatable beer on its own, but the addition of yeast added a complex taste to this beer that certainly did not belong.